Sunday: Mostly cloudy, spot shower. Highs in the 50s. Sunday Night: Mostly cloudy, showers redevelop. Lows in the 40s. Monday: Mostly cloudy, spotty showers. Highs in the 40s and 50s. The first nor’easter of the season is moving out towards Canada but Sunday morning we were still dealing with reports of a wintry mix towards Northern New England while drizzle and fog impacted Southern New England. Meanwhile, there is high surf over the Cape and the Islands. By the afternoon, we will have mostly cloudy conditions with drier air in place and even some breaks of sun. 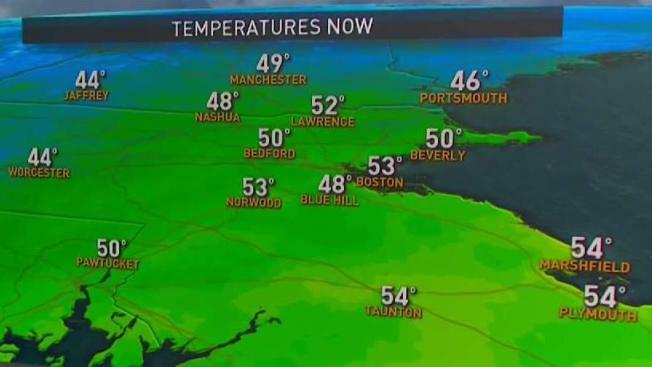 Highs today will be in the 50s south of Boston, with 40s to the north and west. Tonight, lows won’t drop much with temperatures mostly in the 40s. Rain showers redevelop overnight as a separate system brings more showers on Monday with the chance for thunder. Highs Monday will be closer to average, near 60 degrees towards the South Coast and upper 40s across the North Country. Behind this fast-moving weather system, we dry out Tuesday into Halloween. Our next disturbance arrives late Wednesday and it brings the risk of rain back Halloween night in far Northern New England, and late week for the rest of us. By then, temperatures will be rising into 50s to near 60, a bit above average, something we haven’t experienced in a while.